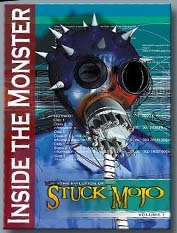 Inside The Monster presents Volume One of a history of Stuck Mojo in rare interviews, behind the scenes documentaries, and live clips as well as photos. You will see the nitty gritty behind the scenes of life in a rock band and on the road. You gotta know that if you’re not serious like Stuck Mojo, you’ll never make it because you have to be commited to your music and your art or there’s no point. What you will see is the real deal in action. Unlike many mainstream bands who won’t allow themselves to be filmed if a hair is out of place, Stuck Mojo keeps it real at all times and in this way you get to know the real band and its members. So you love music and want to be a rock star or in a rock and roll band. Do you know what it’s really all about? Are you in it for fun or as a way of life because there is nothing else you can imagine yourself doing? Well if you want to know what it takes to be a real musician and not just a rock star, Inside the Monster will give you a glimpse. Keepin’ it real is what Mojo have always been about and as you’ll see from interviews and behind the scenes footage, the band is as down to earth and straight forward as their music. Who or What Is Stuck Mojo? Although I find it hard to acurately describe the music of Stuck Mojo, music pundits seem to have no problem attaching labels to bands. Mojo has been referred to as rap-metal, funk-metal, nu-metal, etc. etc. The great thing about this DVD and the rare interview footage presented, is that you get to hear the band talk about their music and find out what it means from the source. When they formed the band they wanted to be kind of an experimental metal band that had real roots oriented sounds to it whether that was early R&B or grass roots reggae etc. But the fans liked the heavy sound so Rich pushed for a more crushing sound which paid off when the gigs attracted more and more people. In an interview with York Plugged In from 1996, Rich says that the name of the band comes from the word “Mojo” from the happening vibe they struck while jamming. They threw that name around for a year and then put the word “Stuck” before it since they were stuck in that vibe. You get answers to questions about the bands influences and backgrounds and attitudes. Such as Rich’s interests in Iron Maiden and Dungeons and Dragons; a self described “metal nerd” in high school. In an interview from “Viva TV” in Germany, it is revealed one of their favorite bands is Helmet!!! More wrestling action can be seen in the entire behind the scenes documentary about the making of the video for “Rising”. You are there in the action with the band and wrestlers. Looks like a lot of fun too. This one also has a commentary track with Rich and Frank. There is a “Soundcheck” video in which you can watch Rich doing raw riffs on stuff like Ozzy’s Bark at the Moon which is very cool. A number of the documentaries feature additional commentary tracks. The European tour 1996 for instance has commentary. Funnily enough on all these tour videos Bonz declares it’s early and he’s not high yet but he will be ! Some of the clips feature other TV show mentions of Stuck Mojo in some unlikely places including the NHL and the Sopranos. Quite cool is a shot from the Sopranos in 1998 of a Stuck Mojo poster on the wall of the kids room. Someone at HBO likes Stuck Mojo! There is a tour highlight reel Volume 1 with clips from 1992 to 1998 and has an additional commentary track. In the summer of 1998 Stuck Mojo opened for Pantera on a European tour. You can see Dimebag (and Phil) on the side of the stage watching them and it’s all the more poingent to watch this after what happened in Columbus. You can watch footage from behind the scenes of the 1996 MTV Europe Headbangers Ball apearance and the filming of the gig itself. MTV did a great job of presenting the band live and it sounds really good too. Live on Squeeze TV is another really great looking and sounding clip of the band live doing tunes from Pigwalk and Rising. The last clip is rare footage from the last Mojo show doing “Hatebreed” with Ryan Mallum in 2000. There are 6 galleries of still photos from various sources as well as posters from many of the shows and pages from Rich’s notebook with notes and song lyrics in progress. You can listen to three of the original demo recordings from Declaration taped in Rich’s living room. The music used on the DVD menus and other areas of the DVD are from the instrumental version of Declaration of a Headhunter. Rich used to sell it on the old Sick Speed site but I don’t know if you can get it these days. At any rate whether you are a new or old fan of Stuck Mojo, this DVD is a must have! Given that there are three hours of content and this is only Volume one, I can’t wait to see what they have planned for Volume two! On my wish list is the actual video of “Rising”, and more live concert footage.